All right......I'm showing my ignorance now. I have no idea what a sentinel belt is. Spelling correction by Microsoft, supposed to be serpentine - have corrected the spelling. Is the serpentine belt not supposed to have an idler? I assume it stretches more than V-belts with temperature and age? As for an idler, if the belt was driving other accessories like a car I would think so; however, driving a single accessory not as critical. I also do not think the load on the belt is that much. Don't know where I would put one, not a lot of room for additional items. Unfortunately they have jacked the price up quite a bit. When I bought it I paid less than $100 CDN delivered to my door. I was concerned about the small (35amp) output but it produced nicely with over 14 volts at 2000 rpm. I used a 2.5" crank pulley and a 2" alternator pulley. Here is the exact same alternator on Amazon.com for $75 with free shipping. I don't know if there would be any brokerage charges but it might be a good way to go. There are some 70 am alternator out there in the same physical size. They are a couple of pounds heavier but they may produce the juice that you are after. If I put on something that big I would go one to one on my pulleys. The only downfall might be that the bike may not charge at a low idle. I'm not sure how many rpm are needed to excite the alternator. I bet that Ernest knows though. Search "mini alternator" on Amazon.ca and Amazon.com as well as Google and you will find many choices. Or go the route that Ernest did. We have a local starter/alternator repair shop here in Ladysmith and I found out after the fact that they too could have built me one for a reasonable price. My total install cost was about $200 CDN give or take a couple of dollars. 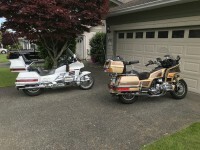 I have since sold the bike to buy an adventure tourer but I have no doubts that the system is still working very well. I continue to look for the right low km GL1200 and GL1500. If I get another 1200 I will definitely do the alternator conversion again. One last note.....you raised a concern about overcharging and blowing up the battery by running high amperage through the battery. I don't think this would be a real concern. Keep in mind that if you follow the alternator power curve they really don't put out that much at low rpm. I'm suspicious that that we never actually achieve the manufacturer's stated output. When you flash the bike up and warm up at an idle output is quite low. Once you are riding down the road your accessories will be running and creating a load. I think as long as you have used adequately sized wire and have fuse protected the system you will be fine. Hi Brian, thanks for writing in. I do not believe that going through Amazon.com is even an option anymore for us Canadians. They simply will not allow the permissive for ordering through the computer. They are forcing us to go through Amazon .ca. It's another example of how we as Canadians are getting hosed. Local alternator builders are a good option if you can negotiate a good price, I agree. That is one of the more likely routes that I will take. There are a couple of options on EBay that sound reasonable. My big concerns are if there is a problem, will warranty be an issue. The other thing is why the 1 kg difference in weight between the Amazon.ca unit at 2.3 kg and the EBay unit at 3.3 kg. In my past experience, with electrical stuff. heavier usually means more copper (Better) But then again, it could have been wound by Orcs. One of my biggest considerations is charging ability at low idle. Would a 35A or a 70A charge better at low idle, or is capacity unrelated to low idle charging? I've been trying to get in touch with Don "Poor Boy" but his Yahoo adress is inactive. I think that may no longer be an option for me. For low idle charging I think you'll need a little more than a 1:1 pulley ratio. It has to do with the rpm need to excite the alternator. I believe if u use a 3 wire that won't be an issue. Ernest can probably elaborate. I ran 2.5":2" and had about 13 amps at an idle. I never did measure current output. I didn't realize that we were shut out of Amazon.com when did this happen? Not sure when it happened. I just could not make purchases in the last year when I attempted. Both times the items were available state side but not on .ca. There are a lot of items that are available where we are being charged way more than the exchange would justify. Just for S....s and Giggles try a purchase and you'll see what I mean. Just decline at the last entry. If you are successful then its a provincial thing. Then I'll really be mad. Why did the first two links not post properly? With my 3 wire alt install, it charges well at start up - mostly because the LTD has a clock and depiction of the US time zones flashing (travel computer). Charges until the battery is charged up. Operates on the highway at a steady 14.2 V to the battery/system. The voltage varies depending on requirements, stopped at a light it will vary, never really going below 13 V. The only reason I have a 3 wire alt is it was the one available. There is also a different power requirement between the '85 LTD/'86 SEi and the ones with carbs. Fuel injected models need a lot more power hence the 500 watt stator versus the 390 watt stator of the carb models. Your '86 Aspy is probably a carb model that does not require the same power requirements. One difference is the fuel pump. The carb model fuel pump is only required because of the position of the fuel tank in relation to the carbs. if it were high enough wouldn't need one - gravity would be good enough. The fuel injected models require a high pressure (28 to 35 PSI approximate) with the appropriate amp draw. 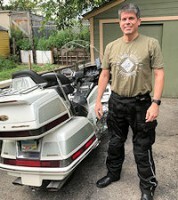 For your bikes, Brian's setup will probably work well, and you should not have to do any modification to the timing belt cover. As always, it is what you can get for parts that matters. I can make orders for alternators from Amazon.com. I don't know if I did something wrong when I tried to order. I don't think so since I've ordered lots previously without issue. I wonder if enough people bitched about it that they backtracked. I'm sorry about the misinformation. Sorry Don, I did not mean to prematurely bury you. Only after posting it, did I realise how crass it may have sounded. I was hoping no one else noticed. For some reason my Yahoo mail was giving me messages that your email was not a valid current address. Now it seems to be working. I don't get it. Had happen with two other email addresses. I probably shouldn't be crushing cans of brew in the middle of the night while on the internet. I buy too much over priced crap on FleeBay that way too. Not a problem. I have been having trouble with my computer & have not been checking in on this like I should. A couple of weeks a go someone on here inquired about a kit. I answered but was not sure if it had went though. I had intended on answering again but forgot. Glad to hear you're still with us, Don. Does anyone have pictures of how they mounted the adjusting bracket on a 85 LTD? Mine has a rod welded to the fairing bracket and will prevent attaching the adjusting bracket the way they seem to on the other models. I think I have sourced the parts I need but would like to be a bit more confident I can do it before I start buying parts. Can you tell me the size of the bore for the crankshaft pulley. You may have to shim the alternator lower bracket to suit. This drawing should get you going. Thank you for the diagram. I am still not sure about the upper bracket. Is the 171.5mm piece flat stock, or L metal with most of the side removed. Did you mount it between the fairing and the original fairing bracket, or below the original bracket? The brackets are made from 1 inch angle, no flat stock used. Here are a couple of pictures for reference. Thank you that is very helpful. I was trying to figure out how to fit the top bracket around the angle tube. I did not realize it needed to be removed. Your pictures help answer a lot of questions, I'm going to go for it. 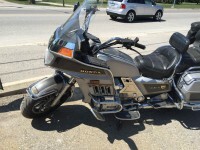 Just got my FIRST Goldwing. I knew going in that there was a BIG chance the stator was bad but I had to replace the battery and starter first. Knowing now for positive that the stator IS bad, I have no intention of paying for or attempting a stator replacement. I WILL however be installing an alternator. 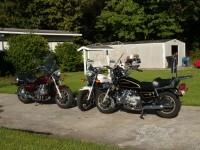 I have a 1986 GL1200 Intestate. Does anyone have any pictures of a completed conversion on this yeah and model? I’ve seen a lot on LTD, but none on the 86’ 1200.
these are from my Bookmarks, and some may be dead.... that is just life. Last edited by AZgl1800 on Thu Jul 19, 2018 2:22 pm, edited 2 times in total. The installation is the same for a carburated 1200. You also have more room because there is no injector or TPS in the way.